Contact the owner Jeff @ 413-387-8868 or burniskecontracting(at)gmail(dot)com.Unexpected House Repairs!!! 1999 Starcraft Islander 2001. 5.0L Mercruiser I/O V-8 with Alpha-One outdrive. Aluminum hull, depth finder, Garmin GPS, Porta-potti, cooler holder for rear, CD player, long range CB, anchor and live well. It has a hard, aluminum top with rear flood lights that can hold well over 300 lbs on it. Has canvas cover and also canvas, zip down partition to completely close off the bridge from wind or rain. Cabin sleeps four and has never really been used. Does not have an hour meter but has super low time being under 300 hours. Original owner is family friend and only fished on Lake Ontario and Connecticut River. Has master kill switch and comes with numerous live jackets, tube, wakeboard, wake skis and all necessary towing equipment. This thing runs perfect and cut through the water. The boat has a couple scratches and really the only things it needs are pinstripes and Starcraft decals. The old ones were faded and I haven't replaced them yet. Has tandem axle easy-loader trailer with greaseable hubs. 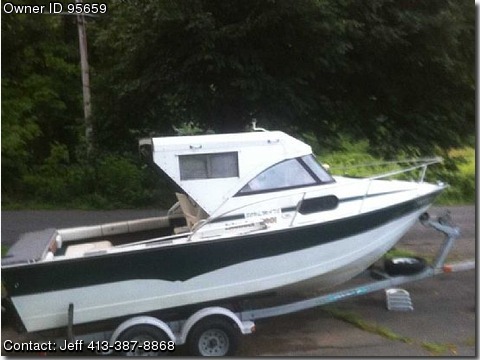 This is a great boat to enjoy the summer with kids or is a fishermans dream. Cash only and no trades. Emails are best and pictures will be on 8-10 in the early AM.